Lion George Veillette, left, sponsors Valerie Tutor; Rick Perry is sponsored by Lion Bill Sartoris; and Lyn Kern is sponsored by Lion Bob Kern. 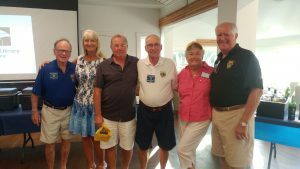 The Sanibel Captiva Lions Club welcomed three new members at the Wednesday, June 20, dinner meeting. Lion Rick Siders inducted Rick Perry, Valerie Tutor and Lynn Kern – all of whom were presented the Lion pin from the their sponsors, who will help guide them in becoming a lifelong Lion. The Sanibel Captiva Lions Club was charted in December 1967, as part of the Lions Club International which is the largest service club organization in the world. The Lions motto is “We Serve” and best known for saving sight. The Sanibel Captiva Lions hold vision and retina screenings each year and collect used eyeglasses for Recycle For Sight throughout the year. In addition, Sanibel Captiva Lions hold hearing and diabetes screenings. The club hosts its popular arts and crafts fair and Christmas tree sale each year to benefit Lions charities supporting sight based services and local community needs, as well as fund academic scholarships. Lions also volunteer their time to several efforts. “I love the motto,” said new Lion Valerie Tutor, an island Realtor and proud native Floridian. “I want to serve our community and make it a beautiful place.” She was sponsored by Lion George Veillette. Rick Perry, who was sponsored by Lion Bill Sartoris, has a background in medical publishing and is interested in becoming involved in the vision and diabetes screening service the Lions provide to the community. Sanibel Captiva Lions meet the third Wednesday of the month with a different guest speaker at the Sanibel Community House. Meetings begin with cocktails and appetizers at 6 p.m. and dinner at 7 p.m. Visiting Lions and anyone interested in becoming a Lion are always welcome. Contact Membership Chairman Lion Steve Schulz at stevenschulz@comcast.net to make a reservation for dinner.